Is the setting of "Attack on Titan" (Shingeki no kyojin) supposed to be Earth in the distant future and Titans suddenly appeared out of nowhere and devolved society to medieval level of technology? Or is this just a completely fictional setting? if we are using geography as an identifying feature of the Attack on Titan Earth, this is not the Earth that we know. 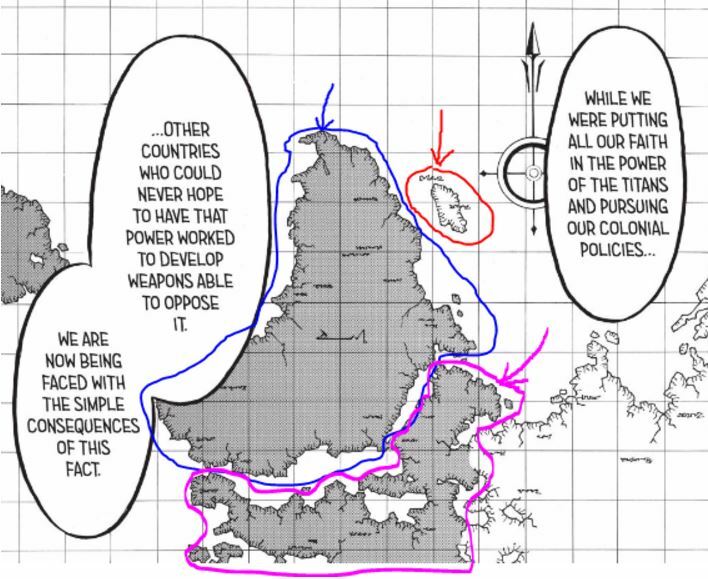 Unless the map was drawn in such a way as to purposely hide defining geographic characteristics, it is likely that the Earth in Attack on Titan is more of an alternate universe Earth. There are a lot of references that we are familiar with, especially later on in the manga, but it is clear that the geography doesn't match up to anything on our current Earth. In addition, the names of these regions are Marley, Paradis, and Mid-East Allies. And the peoples in the first two regions are called Marleyans and Eldians. So it further solidifies that the AoT Earth, while similar, is more than likely an alternate-universe Earth and not the same Earth that we currently reside on. since this is not the same Earth, we can not use our own timeline to judge what time period this takes place. It is a completely different world, albeit with a lot of similarities, but it makes the most sense to stick to the timeline that AoT presents to us throughout the manga and anime. while Paradis Island looks like it's living in our version of the medieval times, the rest of the world is not. 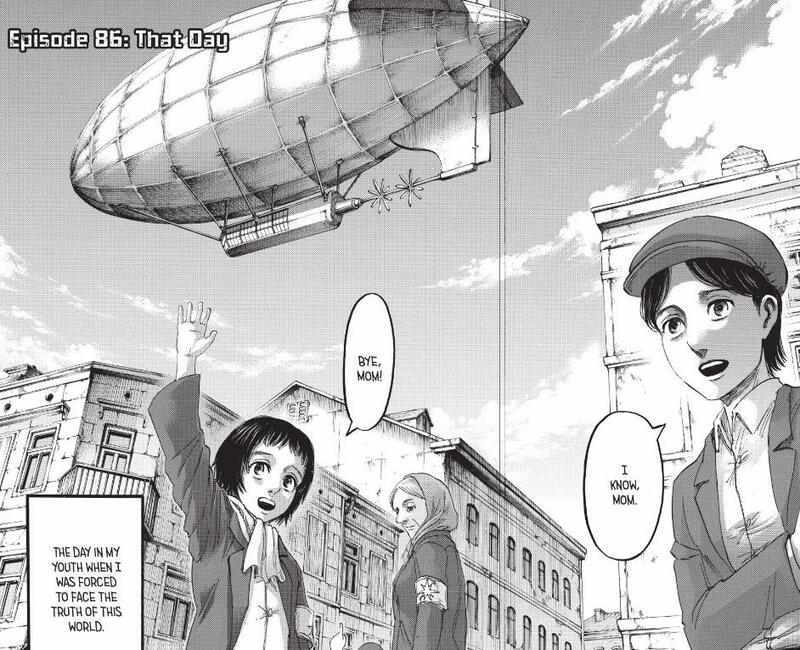 during Grisha Yeager's childhood (so some time before Eren), humanity was in possession of airships and military technology that we might have seen from the 1900s to 1930s or 40s. Again, we can't compare the timelines in AoT to our own since we know AoT's Earth is not our Earth but this should help give you a better understanding of the AoT world. military uniforms that look sort of similar to WWI/WWII era uniforms. In the same frame we can also see the soldier smoking a cigarette while taking a break on a mowed grass lawn. 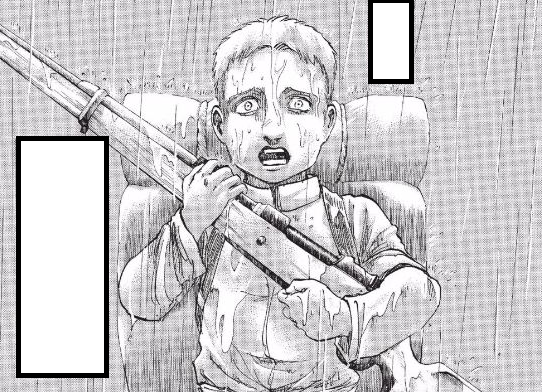 In chapter 94, we can also see the type of firearm that this child is carrying which is an excellent example of more sophisticated technology. I blocked out the text in the frames as it wasn't necessary. we did not, prior to these chapters, have a good understanding of the AoT universe and there's a good reason, too. But those are unnecessary spoilers. I recommend reading the manga for more information on the backstory of AoT for further information on timeline, place, and technology within the AoT universe. Two captured Titans are named Sawney and Bean, which is stated in-universe to be based on the legend of Sawney Bean. The year 850 means that we are at least 850 years following the aforementioned legend, putting us no earlier than year 2350 A.D. This seems possible but unlikely, as their technology shows no signs of being derived from our own. The year 850 is some marker to an event that happened prior to the legend, in which case we have no frame of reference other than that the story must take place in or after the 1500s. This seems to be the more likely answer. The oriental races are wiped out; Mikasa has her mother's oriental blood, but is the last surviving member of the Asian races. With this in mind, it is highly unlikely that it is in Japan or even nearby (though the location is also unstated). However, seeing how many names are European (Jäger is German for "hunter", Armin is a Germanic name, cf. Arminius & Herman), it's most likely that the story takes place in Germany, or at least in Europe, where the remaining survivors of the Titan catastrophe are now cornered. I'm assuming it would be in Germany and/or the surrounding European countries. The architecture of the districts within the Maria and Rose walls (including their outliers like Shiganshina District) looks to be very much like traditional German architecture. However, the Stohess District resembles Czech architecture and Utopia resembles Parisian mid-rise styles. The tall 80m-treed forests which are both in & outside the walls could be the Black Forest in Germany. There is also a small alpine section within the walls & outside, which could be the Swiss/Italian Alps. Not only that, but the characters have German names such as Reiner, Bertholdt, Jaeger, etc. It's a completely different universe and settings than ours (still Earth though, just under different circumstances). However, according to technological advances and the construction style, I'd say that the year they describe, around 800 - 900 doesn't seem far fetched. As for the location, I'm not sure, the names of the characters don't seem Japanese, something European maybe? So first of all, the story cannot possibly be taking place 2000 years in the past. I am not going to talk about technology development or the size of the characters (2000 years ago, Levi Ackerman wouldn't have been considered as short). Anyway, Sasha gave me the first part of the answer. In the trainee corps arc, we can see her eating a potato, and the potato was imported into Europe from the South America, which proves the story takes place after the discovery of the American continent (Europe really started to grow potatoes in the 17th century...). But then I ticked on how they calculated the size of the titans. They used "meter-class", which mean they have the metric system. The metric system having been invented after the French revolution in 1789 and was finally accepted by the French Academy of Science on 26th March 1791. The story should take place after this date. I've also noted that Mikasa (in the trainee corps arc when Eren seems unable to have his "natural balance") speaks about "artisans" who make the 3D maneuver gear, and with a look with the general development of the city (no trains, no steam boats). This suggests that the industrial revolution (~1840) has not yet taken place. My theory is that titan have appeared (year 743 in the story) between 1791 and 1840 (and that because of that new-found enemy, the industrial revolution never took place...). The story starts with the colossal titan 102 years later (year 845 in the story), which means between 1893 and 1942 in our calendar. My guess is 52.2051, 47.5557 on your map. It makes sense geographically - perhaps Germany led the way to the evacuation, and it seems more logical for Asians to have arrived here rather than in Western Europe. The one thing I looked for was that there are rivers that passes through all the districts, through all 3 walls. Though the map referenced in the manga seems to have two rivers (one running north-south and the other running east-west, roughly speaking) crossing through the walls. I read an article stating that the story take place in Bavarian era. Too bad I forgot where I read it, and after a brief check on wiki, it is said that There had been a kingdom ruled by a king in the Bavarian Era, in Germany, and we know as well in the anime that the three walls were under a King's reign. 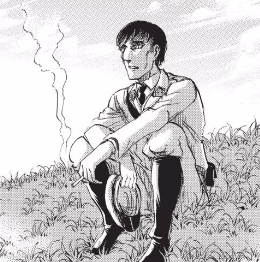 Since some of the characters in the show talk about the world before (Hanji and naming the titans after the infamous cannibal Sawney Bean), it's completely likely that the series takes place in the future rather than before common times. As for location, it's most likely that the Walls are located in Germany, or nearby in Europe. However, it's also likely for the series to take place in Northern US, border-lining with Canada. Mostly since many German immigrants settled in that area, and majority of SNK characters are German. At the same time, it leaves room for reasons of why there are many other nationalities, like Japanese and French. Since America is just one big melting pot in itself. You are all forgetting the fact that they possess flintlock firearms and sophisticated pneumatic mechanisms within their 3D gear. Point being the story has to take place in a post-Renaissance period. What about in the opening episode where it says "To you, two thousand years in the future"? At first I thought it meant that we're (roughly) two thousand years after the rotation from BC to AD, but since the show starts off in 845 (or 844, can't remember atm) that doesn't make sense since we're obviously not in the year 2845. The other option would be to add two thousand years to our current timeline making it 4013 and then subtract 845 to get 3168, the year that the calendar supposedly reset again. It bothers me that it's not clear when the story is supposed to take place because I think it would help in solving some of the mysteries if we at least had a time period to work off of. Then again, maybe that's the point. Since the titans have only been on the earth for 100 years, and the people left only have technology of Cannons, ect. They obliviously aren't going to be in a future of our timeline with this technology, but they could be if other events were changed in their past. But it seems way more likely that they are around the year c.700-c.900 on the original timeline. "she's exotic. what they used to call an Oriental.You know about all that right? back when there used to be different breeds of people, a bunch of them from the far east came scrambling here for safety. the old perverts in the capital really go for that sort of thing. this little beauty's going to fetch a mint at auction. it's great business. she's the last of her kind. all the rest of her people died out." hope that helps. the year that it starts out on is 845 so the yearly calendar reset for some important reason, but it hasn't revealed a lot about the history yet (just that the titans appeared over 100 years ago.) As far as location goes it's safe to assume that it is probably German. accounting for the kidnapper's claim that there is currently only one race and we have names like: -Yaeger (german for hunter) -Arlert is old german anglo-saxon, and Armin's wiki page trivia section states that "The name 'Armin' may have multiple meanings, either from an old German word meaning "whole", or "Herman", meaning "soldier"". http://shingekinokyojin.wikia.com/wiki/Armin_Arlert -Erwin - Derived from the Germanic name Hariwini, composed of the elements hari "army" and win "friend". Add it all up with a lot of blonde hair (Armin, Reiner, Nanaba, Christa, Annie, Erwin, etc) and it seems that they were leaning toward a German-oriented character base with names that are literal puns toward the fact that they are soldiers. What race are the humans in Attack on Titan? What language do they speak? What is Shingeki no Kyojin's Year Zero? What happened to people with other skin colors? Has the creator been interviewed about when the Attack on Titan story takes place? Is “Attack on Titan” taking place in the past or in the future? Who is this ghost from episode 8 of Shingeki! Kyojin Chuugakkou? Were the War Hammer Titan and the Cart Titan ever shown in the anime? Which other nations are there in Attack on Titan world aside Eldia and Marley?